Mouser Electronics, Inc., the industry’s leading New Product Introduction (NPI) distributor with the widest selection of semiconductors and electronic components, is first to offer the LDC2114 Evaluation Module (EVM) for the LDC2112 and LDC2114 inductive touch solutions from Texas Instruments (TI). A new addition to TI’s sensing solutions, the LDC2114EVM demonstrates the use of inductive sensing to detect and measure the presence of conductive objects to implement inductive touch buttons. The LDC2114EVM features the LDC2114, a multi-channel low-noise inductance-to-digital converter optimized for inductive touch applications on monolithic surfaces. Inductive sensing technology enables touch button design on a wide variety of materials such as metal, glass, plastic, and wood by measuring small deflections of conductive targets. The sensor for an inductive touch system is a coil that can be implemented on a small, compact PCB located behind a panel and protected from the environment. The LDC2114EVM, now available exclusively from Mouser Electronics, can connect up to four buttons using the LDCCOILEVM or customized coils designed using the WEBENCH® Inductive Sensing Designer. The board offers integrated and configurable algorithms for button press detection with onboard LED indicators. The LDC2114 consumes as little as 6µA at 0.625 samples per second, and designers can configure the device at different duty cycles to optimize the power consumption of their system. 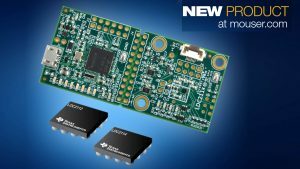 TI’s LDC2112/LDC2114 inductive touch solutions, now available to order from Mouser Electronics, are 1.8V, multi-channel low-noise inductance-to-digital converters with integrated algorithms to implement inductive touch applications. The two-channel LDC2112 and four-channel LDC2114 devices employ an innovative inductive-capacitive (LC) resonator that offers high rejection of noise and interference, with a wide range of oscillation frequencies from 1 MHz to 30 MHz. With adjustable sensitivity per input channel, the LDC2112/LDC2114 can reliably detect material deflections of less than 200 nm with a wide range of physical button structures and materials. The high-resolution measurement further enables the implementation of multi-level buttons. The LDC2112/LDC2114 devices can operate in an ultra-low-power mode of 6 µA for optimal battery life, or can be toggled into a higher scan rate for more responsive button press detection for game play or other low-latency applications. The devices are configured through 400 Hz I2C, and the only external components necessary for operation are supply bypass capacitors and a COM pin capacitor to ground. The LDC2112/LDC2114 devices are ideal for smartphones, wearable devices, tablets and PCs, virtual reality headsets, remote controls, and human-machine interface (HMI) panels and keypads. 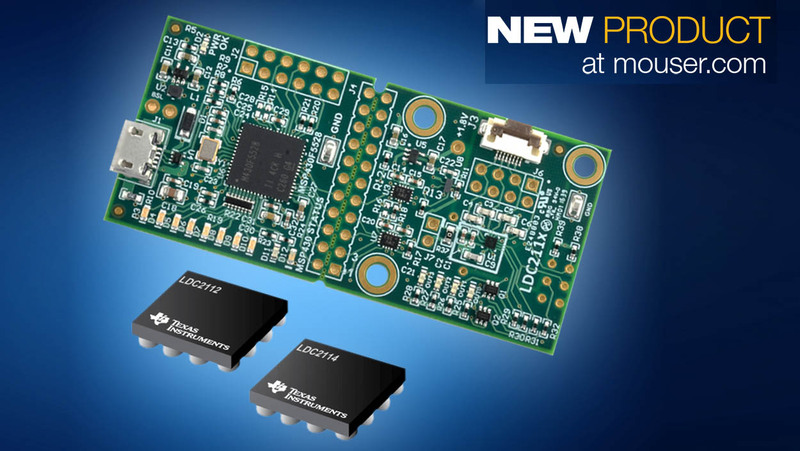 To learn more about the LDC2112 and LDC2114 devices, visit http://www.mouser.com/new/Texas-Instruments/ti-ldc2112-ldc2114-sensors/. To learn more about the LDC2114EVM, go to http://www.mouser.com/new/Texas-Instruments/ti-ldc2114evm-tool/.